Swifttech (Pvt.) Limited Lahore Punjab. 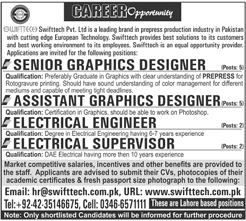 Applications are advised to submit their CVs, photocopies of their academic certificates & fresh passport size photographs to the following Email: hr@swifttech.com.pk. Only shortlisted candidates will be informed for the future procedure.